Rotorua Mountain Biking - The Whakarewarewa Forest is home for Rotorua bikers. Don't Know How To MTB? We have an outdoors culture here and it is never more self-evident than when you take a trip out to the forest. Mind you, even in the city you can tell because just about every second vehicle has a bike or bikes on the back. Sometimes 4 or 5. Apart from the hard-core bikers you would expect to see, look out for young parents with little ones on teeny-tiny bikes. Sometimes their little bikes are attached to the back of mum or dad's bike. So cute. Over the years I have also noticed a LOT more cyclists not in the first flush of youth anymore (ok, I'll put my hand up, that includes me) so if you are older; come on out… come on… you know you want to do it… no need to be shy. It's great fun, believe me. 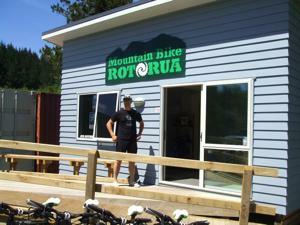 There is a new mountain biking business on site at Waipa by the name of Mountain Bike Rotorua who hire out bikes. Their hours of business are 9am to 5pm, 7 days a week. 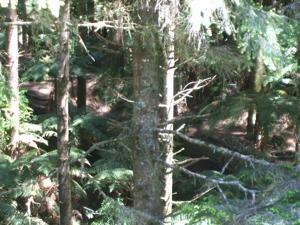 During the summer they also have their bikes available at the Rotorua Redwoods. 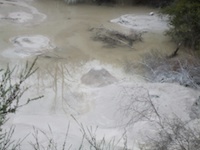 Current rates can be viewed on the Mountain Bike Rotorua website. As part of their service, bike mechanics are available to do minor repairs and adjustments and there is also a store for things you may have forgotten to bring along such as pumps, helmets etc. Don't Know How To Mountain Bike? Not a problem. 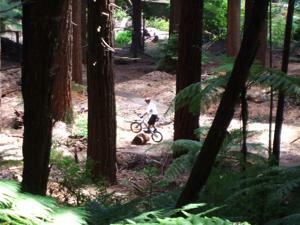 Rotorua has a Mountain Bike Skills Clinic. A girlfriend of mine did the basic Phundamentals Clinic and her confidence improved out of sight. She roams over the hills on her bike for hours at a time now. Children can also do the clinics but if they are under 13yrs they will need to be accompanied by an adult. (There is quite a bit of theory involved). 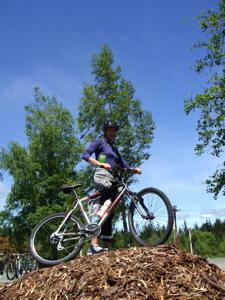 The Mountain Bike Skills Clinic says that '…as long as you can stand up on two legs you'll fit right in'. There are Women's Only Phundamental Clinics if you are shy or… you don't want to worry about any men getting antsy… as they do huh? If you are serious about mountain biking and want to learn more, in addition to the Phundamentals which everyone has to do there is also the Trailmaster Clinic and Downhill Clinic. Strange sounding things that I don't even want to think about are covered off… like jumping, bunnyhops, pumping on rollers, weighting and unweighting over obstacles, ruts, chutes, off camber… the mind boggles. The current pricing for the Mountain Bike Skills Clinics can be found on their website. Go into 'Read More' for further information on the particular clinic you are interested in and for the pricing, times etc. Back to the more leisurely aspects of mountain biking. Mountain Bike Rotorua offer guided bike tours through the forest as part of their service. 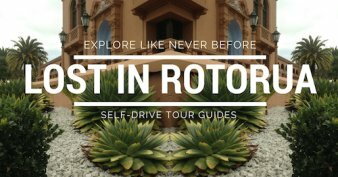 There are ½ day and full day tours with pickups from your accommodation or the CBD. The cost includes the pickup/dropoffs, a hard tail bike (whatever that is), and is suitable for 8yrs up. 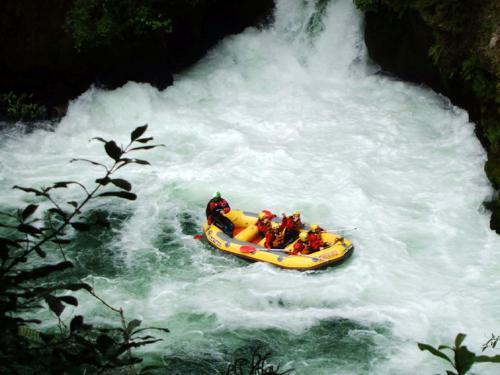 Mountain Bike Rotorua also have a very good combo which includes the above ride plus Kaituna Waterfall Rafting and Kayaking on Lake Rotoiti. Have a look at the prices and also some other bike tours at different venues on offer at the Mountain Bike Rotorua website. Can you see it? 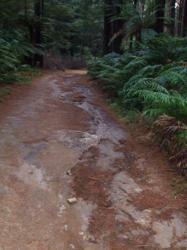 One of the many tracks used for Rotorua mountain biking. There are all sorts of mountain bike tracks, forestry roads and trails out in the forest with weird and wonderful names. Click on any of the trail names to find out the Grade of track (they go from easy up to Grade 6 which would only be for very experienced riders), also how long the trail is and a little bit about the actual trail. The Rotorua Mountain Bike Club along with Red McHale and the guys doing community service do a heck of a lot of work on these trails; maintaining and creating new ones so kudos to them for that. 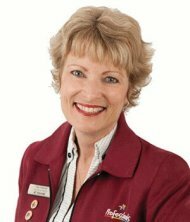 They have created something that is truly remarkable and beneficial to not only the community but also our visitors. Considering that there are over 100km of trails in the forest a map is probably a 'must have'. 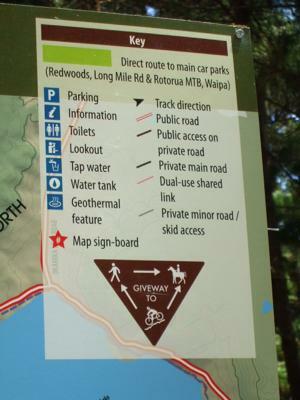 Mountain biking maps are available at both the Rotorua Redwoods Information Center & Gift Shop and Mountain Bike Rotorua. A comprehensive Recreation Guide is available for purchase (funds raised go towards track maintenance) with mountain bike maps showing all the trails. There is also lots of good info and photos. The Recreation Guide includes walking and horse trekking information as well. You might want to buy a Manky (navigational map and hanky combined). They have the mountain bike tracks on one side and the walking tracks on the other. These are real handy as you don't have to worry about the maps getting wet and ruined. You can stuff it in your pocket and forget about it until you need it. Very cool idea. 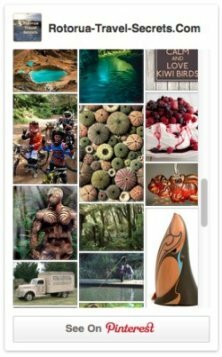 Both the Rotorua Redwoods Info Center and Mountain Bike Rotorua have daily info relating to current road closures/safety etc. for all the tracks. 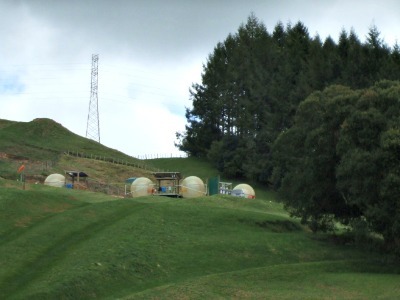 A lot of people make use of the Southstar Shuttles to get to the higher Rotorua mountain biking tracks. Saving their energy for the best bits huh? Shuttles run from the main mountain bike carpark at 9.30am and 1pm. Once in the forest itself there is a central point at the Hill and Pipeline Roads intersection. From here the shuttles make runs up to the top every 15mins. Now this can get a bit confusing. They run Saturdays, Sundays, April and October School Holidays and Public Holidays (apart from Christmas and Boxing Days). During the summer they run daily 27 Dec - 1 Feb (except for Christmas and Boxing Days of course). Last pick-ups for the day are 5.30pm Saturdays and 3.30pm Sundays. Daylight Saving in New Zealand runs from the last Sunday in September when clocks go forward 1hr and ends the first Sunday in April when they revert back. Additional shuttles run Tuesday and Thursday evenings during the daylight saving period. They leave the main carpark at 5.30pm getting in 5-6 runs from Hill and Pipeline Rds before dark. Current rates can be viewed on the Southstar Shuttles website. If you head south from the Rotorua city center you will go past Te Puia on the left (can't miss it… big white concrete wall) and come to a gradual rise in the road. The turnoff to Waipa State Mill Rd (where the mountain biking is) is on the left about 50m (160ft) over and down the other side of this rise. Turn in here and the main Rotorua mountain biking carpark is on your left about 100m (328ft) in. If you zoom in on the google directions map you will see a 'P'. That's your stop. You can't miss Mountain Bike Rotorua anyway, it's plonked pretty much on the side of the road with a big sign. If there is an event on you can continue along the road to where I have marked the map with a 'B'. 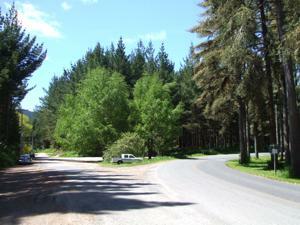 This is a secondary parking area where you can enter the forest via Hill Rd. You will be parked on a hard right-hand corner either side of the road. You will see a gate across the road you arrived on - you don't want that one - look for a forestry road gate (gravel road); that's Hill Rd - straight ahead in the photo. Just ride around the gate to gain entry. If you enter on the left-hand side of the gate you will see a large deep hole in the ground. I've been in there… head first… off my bike… and it had a canopy of blackberry vines covering it at the time. It wasn't pretty to say the least so you can see why I mainly stick to the roads. I'm far too accident prone. Not far inside the gate there is a big map of the biking trails and roads. This will give you a good overview of the area if you haven't got a map. Hopefully you have. 15mins should get you to the forest from the city center. Currently there are no services on site for food so the majority of bikers take picnic lunches and their own drinks. In the near future Mountain Bike Rotorua are looking to add a cafe. What form it will take I am not sure so will update once it is in operation. Updated 03/04/12 - We now have coffee, yay. 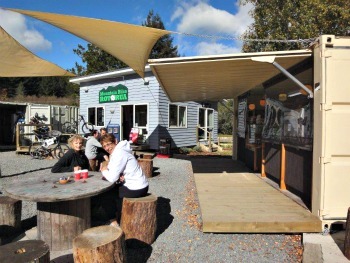 Waipa Store Cafe, operating out of a converted container, is located right next door to Mountain Bike Rotorua. If anything looks familiar that may be because the owner, Sarah Uhl, also owns the Okere Falls Store, another popular local cafe. My girlfriend Fiona and I tried it out yesterday and yes, the coffee is great. It was a bit early in the day to be eating so we didn't try the muffins. Lots of tasty looking food though. There is plenty of parking at Waipa but on the weekends, during the summer holidays or when an event is on it CAN get mad out there. The toilet facilities aren't the best. There are portaloos beside the carpark with more brought in if there is an event taking place. Big changes are in the works at the moment with proper toilets on the way. If you're caught out in the forest it will be au naturel I'm afraid. You could always be like some of my friends who are never without toilet paper. If this isn't enough for you check out what else you can do here.